Enphase Energy Inc. (“Enphase”) (http://enphase.com/) is a privately-held enterprise based in Northern California (founded in 2006), led by experts in telecommunication, networking, software and solar products, and supported by leaders from throughout the solar power industry. 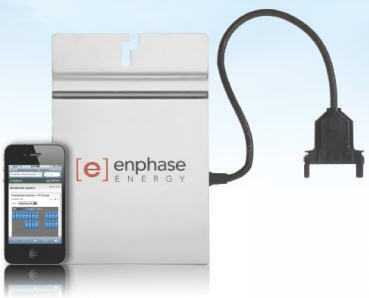 Enphase Energy delivers solar power to homes and businesses with the microinverter system based on high-tech approach, making solar energy more productive, more reliable, and smarter. As a pioneer of inverter technologies for the solar industry, we make solar simple and energy smart systems, creating a zero energy footprint. By combining solar energy with advantages of communications technology, all our products make solar power systems productive, reliable, smart and safe. That maens the energy harvest is increased by solar panels by up to 25 percent (technology improves the efficiency of solar cells arranged in modules). Solar microinverters are small devices that sit on a PV module, converting direct current, DC, from a solar panel into alternating, AC, current. Enphase micro-inverters, for example intended for roof solar panel applications, are: M215 (the latest innovation), M190 and M210 (95.5% CEC efficiency, output power: 210W, works with 72- and 84-cell PV modules, recommended solar module power: 240Wp, Integrated monitoring and powerline communication, 15 year warranty, 14AWG integrated cable for 15A branch circuit, NEMA 6 enclosure rating, CSA listed per UL 1741/IEE1547), D380 (“TwinPack” comprised of two 190W microinverters in a single enclosure, solution which save money, space and cables and provide faster instalation; features: MPPT, integrated monitoring and powerline communications, 15 years warranty, NEMA , CSA listed per UL 1741/IEE1547, 12AWG trunk cable for 20A AC branch circuits, 95% CEC efficiency, 60- and 72- solar cell modules, output power 380W). Each microinverter connects to an individual solar panels and perform DC to AC power conversion. The M215 is lighter weight than the M190 and offers a “single-bolt” mounting bracket that makes installation easier. 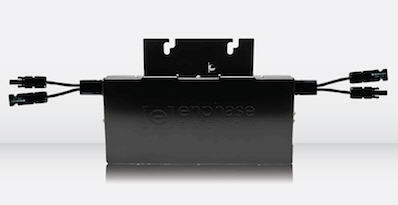 These days, Enphase has developed a highly reliable micro-inverter, designated as M215-60-2LL-S22, M215-60-2LL-S23, M215-60-230-S22 or M215-60-230-S23. 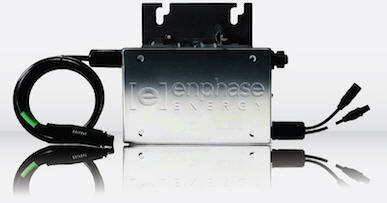 The Enphase M215 (http://enphase.com/products/microinverters/) is the world’s most efficient solar microinverter. Based on Enphase’s third generation technology, the M215 incorporates the latest innovations in solar power electronics and custom microchips to deliver 96% CEC efficiency and a range of patented performance features that maximize the performance of 60-cell solar module. Our microinverters are designed for residential and commercial grid-tied PV applications. Each microinverter connects to an individual solar modules and perform DC to AC power conversion. This product has a “limited warranty” () upload which covers defects in workmanship and materials of the solar inverter for a period of 25 years (the “Warranty Period”) from the date of original purchase at point of sale to the end user. During the Warranty Period, the warranty is transferable to a different owner as long as the Microinverter remains installed at the originally-installed end user location. Each Micro-inverters support a new network technology and web-based software. This enables great new levels of connectivity in every solar array. With the 215-Series comes the “plug and play” Engage System, which further simplifies the installation process. Engage Cable is a new size-to-fit cable with built-in connectors that can support an entire 4kW system on a single branch. The engage cable could be cut to need length, always comes with additional cable termination and splice kits. Second, Engage Port is an ACM microinverter port which replaces the standard DC junction box on single solar panel, enabling photovoltaic manufacturers to integrate our technology into their product portfolio, while installers continue to benefit from others Enphase’s systems: Engage, Envoy and Enlighten, too. The Enlighten software where owner can monitor and manage their solar power array 24h per day. Works with 60-cell modules ONLY. - ENVOY Gateway (Data logger) for a maximum of 240 connectors, the price of each Envoy is between 300 € and 365 €.